Romn322 Some rust on the screws after a year, but fast, durable. Would buy again. Installed three! No sags, easy install! Easy Gate All three are perfect. I've included a before ricking and after ricking picture. Yes there is only one picture. After adding the slats the gates did not sag a single bit. Even after a 3 hour long torrential downpour adding who knows how much weight the gates still refuse to sag. Pinger The easiest gate I built yet. This gate is very versatile and simple, my 10 yr old can do it. If you have trouble with this gate, you may want to hire my 10 yr old. As I read these comments, I now understand why the army uses stick figures of people building things. I only wish they would weld less globs on joints BC I have to notch my wood so the is no strain on the metal brackets. Oh and if you only flip it over, spin it around, flop it up side down, you'll find this gate can be placed in any ANY configuration, any sized boards with the understanding that the gate may be set in an inch or so, in some cases; shouldn't be a big deal unless you're really nuts about flush mounting. One other wish is to have option for more brackets to place a center board across, oh and pix of ideas pep's had done. Dave374 I had the frame done in less than an hour and the gate is 10X better than the one I ripped out. Tony I bought the product about a month ago. It went to together very easily. The now is no sagging to the gate. My old gate had a diagonal piece but the easy gate is much superior. The free shipping was great. Taylorchomes I am a professional contractor. I have built gates for fences every way you can possibly think of. This is the best system I have seen yet. The brackets are strong and simple as well as fast. I just did a fence this past week with 4 gates and had them all built in less than an hour. For all the reviews that say it needs instructions, this is so simple that the picture on the front of the box is more than enough instruction. I highly recommend this product and even though I am a professional any homeowner shouldn't have any problem using it. Lil T I used 3 kits for 3 gates in my fence 3 years ago. They were super-easy to put together and versatile. I made a narrow, tall gate, a wide gate and a normal gate. They all look as good as the day I installed them. clem I have purchase 3 set about 10 years ago. It was easy and fast to do. I have purchased 3 more sets because my wood fence is falling apart and I decided to have every thing new. The old set I will use for the other side of my house. In fact I purchased another set for my in-law because their gate is sagging. GateBuildingAmatuer Overall I was pleased with Easy Gate No-Sag Bracket Kit. I ordered 3 of them, and have used 2 so far. In one of the kits the opening on the hinged brackets was 1/8 too small to receive the treated 2x4s I was using, so I had to trim the 2x4s down. In both kits the weld's in the hinged brackets interfered with the 2x4 fitting snugly, so I had to angle cut 1/4 off the corner of each 2x4. One kit was short on screws. Also, no instructions at all were included or available online, resulting in me having to do rework. "20 minute" setup would probably be true if you had all wood precut and all tools ready at hand, had assemble several before and are a pro builder. For me, with no instructions, it took closer to 3 hours per gate. But I'm pleased with the outcome, thus the high rating. Homax EASYGATE® No-Sag Gate Kit enables any homeowner to build a sag-free gate frame in as little as 20 minutes. The kit includes 4 gate brackets with attached hinges and screws for easy assembly. Hinges and screws are constructed of powder-coated steel in a black finish to resist rust. Use with openings of 25" to 72" wide and there’s no height restrictions. Building a fence or utility gate properly is critical to reduce sagging and maintain use and longevity over time. Homax EASYGATE No-Sag Gate Kit enables any homeowner to build a sag-free, square gate in as little as 20 minutes. The kit includes 4 gate brackets with attached hinges and screws for easy assembly. All parts are constructed of heavy powder-coated steel in a black finish to resist rust. Constructs a gate for an opening of 25" to 72" wide, with no height restrictions. Fits various lumber sizes (2x3s, 2x4s, 2x6s, etc.) and types. Choose a left or right swing. Ideal for use with fence gates, driveway gates, corral gates, and shed doors. 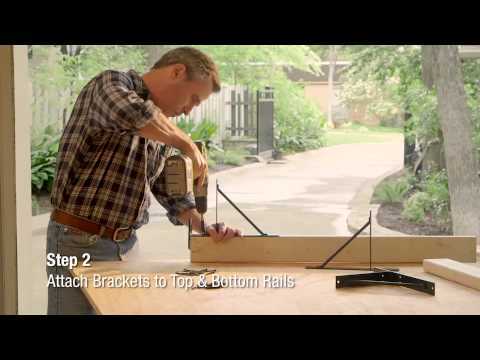 Why Choose Homax EASYGATE No-Sag Bracket Kit? Build custom sized gates, add to pre-fab gate applications, or repair sagging gates. Homax EASYGATE No-Sag Gate Kit can be used on wooden fence gates to add curb appeal and character to your home, while enhancing privacy and safety. In addition, you can use EASYGATE to build utility gates such farm fences, livestock stall doors, and driveway gates to protect your property, equipment and more. Building a sturdy, square gate and eliminating problem gate sagging is a snap with Homax EASYGATE No-Sag Bracket Kit.